Edward Loure, from the Ujaama Community Resource Team! When Edward is not bathed in sunshine and accolades, he can be found protecting Maasai grazing lands from land grabbing tour-operators and safari companies. UCRT, our fantastic partner in Tanzania, is a grassroots civil society organization made up of pastoralists and hunter-gatherers, who are passionate and committed to bringing about positive change in their communities. For almost two decades, they have worked across northern Tanzania, helping more than 75 communities secure more than half a million hectares of communal land. The Goldman Environmental Prize is the world’s largest award honoring grassroots environmental activists and Loure was invited to San Francisco, California to receive the award at a prestigious ceremony alongside the five other recipients. 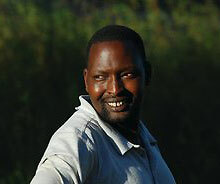 The prize recognises Loure’s leadership and UCRT’s work in reconciling the competing needs of development and wildlife. UCRT uses a legal mechanism that grants land rights to entire communities rather than to individuals, securing rights to communal land for pastoralist and hunter-gatherer communities in northern Tanzania for future generations. Loure also used his acceptance speech to emphasise the model that we cherish here at AI: supporting grassroots activism – facilitating but not dictating. Enabling but not patronising! The proof’s in the pudding Edward Loure. You can read more about Loure here. And you can meet some of our other partners here. Who knows – it could be one of them next year!